The internet in India is known for not being great, which is why a lot of services are trying to provide for them. YouTube have made their next attempt with that which should make downloading videos a little cheaper over a data connection. This is an addition to an option YouTube provided Indian users with back in 2014 that allowed users to download videos and watch them offline. This meant that users wouldn't have to worry about wasting data on videos taking ages to buffer on the slow connection. Now YouTube has decided that they want to offer users the chance to download the videos when the data is cheapest without needing to be online to do so. 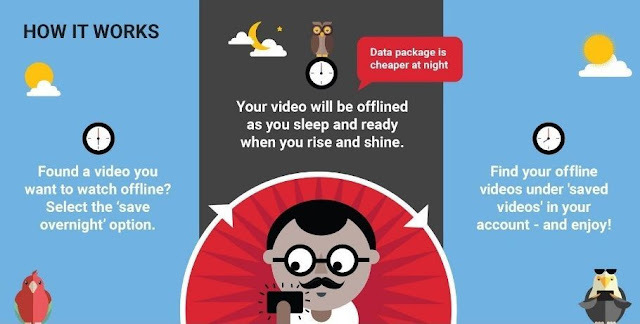 In India, many of the networks offer the cheapest data hours between midnight and dawn. At the moment, only subscribers to Airtel who may have the pre-paid Happy Hours which gives them back half their data for scheduled downloads between 3am and 5am and Telenor who have a cheaper night deal between 11pm and 7am are able to access this Smart Offline feature. If someone is working and has to get up early, but might want videos to watch during their commute or want to download videos so they can leave their phones to entertain their kids they're going to want to be able to download the videos when it's cheapest so they can get the most out of their data. If users want to download these videos overnight, then they simply have to go onto the video and select the save overnight option. The video will download automatically during the period of time that data is cheaper. This is practical for the Indian users and a great idea from YouTube. If they want to make YouTube worth accessing in India, then things like this are completely necessary. This option is only for users on data. If you have a wi-fi connection then you can't download videos overnight from YouTube in the same way. It makes sense as this feature is just designed to make accessing YouTube cheaper for Indian data users.